Like our US-23 trip, US-19 travels from an inland sea, to the ocean. Highway US-19 runs about 1386 miles, from Lake Erie at Erie, Pennsylvania to the Gulf of Mexico at Memphis, Florida. 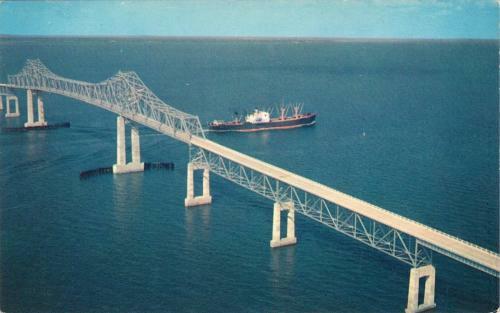 The highway was extended to its southern terminus of Memphis in 1954, when the original Sunshine Skyway Bridge opened. It has had essentially this same route since, so we would have seen the same places in 1962. Like many of these old roads, most of the route from Eire to near Waynesville, North Carolina has been paralleled by interstate freeways. But unlike many, it has not been shortened: the US-19 signing remains up. This is another highway that splits into east and west segments, which Roadtrip-'62 ™ discussed for route US-11. The segments of US-19E and US-19W occur in Tennessee and North Carolina. To make matters more confusing for following the route, there is also a US-19ALT in North Carolina. Highway US-19 begins south of downtown Erie, Pennsylvania, at US-20. 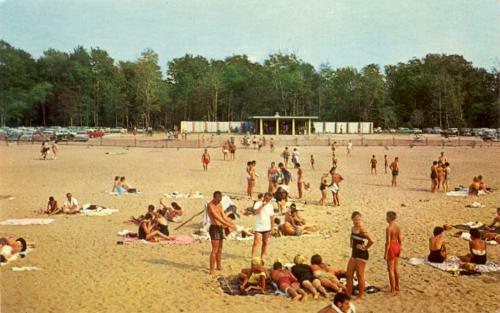 A place we could have enjoyed in town in 1962 is Presque Isle State Park, about 5 miles west of the end of US-19. It was established as a state park in 1921, using lands that had largely been used in public service for over two centuries. During colonial times, the land was home to forts of the French, British, and finally the Americans. During the War of 1812, Commodore Oliver Hazard Perry's Great Lakes fleet was partly constructed and based here. In 1873, one of three navigation lights was built, with a red brick house for the lightkeeper’s residence. Today, the Presque Isle Light is still operated by the United States Coast Guard, flashing its light to warn ships of the sandy Presque Isle peninsula that juts into Lake Erie. The lighthouse is open to public tours during the summer months. The peninsula is mostly sand, and is constantly being reshaped by waves and wind. Since the 1950s, it has also been significantly reshaped by man by dredging in the adjacent bay. This work expanded the park with 3 million square yards of dredged sand, giving the park a pleasure boat marina. Other park facilities were constructed and a nature preserve set aside in 1957, so we would have seen a new park in 1962. The claim to fame of Presque Isle State Park is the beaches: they are Pennsylvania's only surf beaches! Our US-6 roadtrip met US-19 just west of Mill Village, Pennsylvania. As the two routes traveled together for the next 23 miles to the outskirts of Meadville, Pennsylvania, you can read about it on those pages. We visit Cambridge Springs to stop at National Wildlife Refuge, Saegertown for lunch at Eddie’s Footlong Hot Dogs, and Meadville, home of Channellock pliers and tools. North of Pittsburgh, Pennsylvania, US-19 splits off a truck route, US-19 TRUCK, which joins the I-279 freeway for some distance. Both US-19 and US-19 TRUCK travel through the west side of Pittsburgh. The routes cross over each other just south of the Fort Pitt Tunnel and then rejoin south of the city in Mt. Lebanon, Pennsylvania. To see some great gardens and art, leave US-19 and head east into town. The Phipps Conservatory and Botanical Gardens was opened in 1893 and encompasses 15 acres, including a 14-room glasshouse and 23 distinct garden areas. The original building was presented as a gift to the City of Pittsburgh from philanthropist Henry W. Phipps. Many of the original plants came from the World's Columbian Exposition in Chicago when that exhibit closed. Besides plants, there is also artwork including sculptures, chandeliers and more. The orchid collection is wonderful, with plants I never would have guessed were orchids because they don’t all fit the typical types you can buy at your local nursery. The room known today as the East Room was known as the Cascade Garden in 1962, when it featured a cascade of water in a channel of step-sized drops surrounded by cascades of flowered terraces. And, not only are the interior and exterior gardens beautiful, but the site occupies the edge of a hill overlooking the Panther Hollow valley and a historic neighborhood on the other side. Continuing south, US-19 crosses West Virginia. 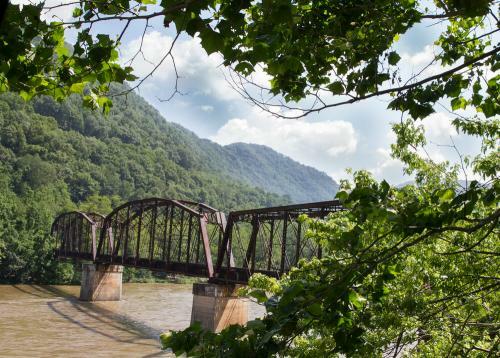 Near the middle of the state it crosses the New River on the New River Gorge Bridge, the world’s fourth longest single-span steel arch bridge. The bridge was opened in 1977 and the New River Gorge National River recreation area below it was established in 1978. Obviously, both are too new for our 1962 journey. What we can see in the area though, are remains from the coal mining towns along the river that were here back around 1962. To do that, we need to take old US-19, which today is WV-41. Before the New River Gorge Bridge was constructed, US-19 followed the very roundabout route of today’s WV-41 between Mt. Nebo, West Virginia and Beckley, West Virginia. The old road crossed a bridge near water level at Prince, which is still open today. The bridge was built in 1931 and operated as a toll bridge until 1946. So if you want, you can add an extra 10 miles of slow, winding but very scenic, 2-lane roads, and travel the way we would have in 1962. We can visit three of the coal mining ghost towns along old US-19 in the New River Gorge: Quinnimont, Prince, and Terry. The main line of the C&O Railroad was completed through the gorge in 1873, and the first shipment of coal left Quinnimont later that year. Quinnimont was the first mining town of New River Gorge. At its height of about 500 inhabitants, the town had two churches and two schools, due to the segregation of its black and white communities. The New River Gorge once had over 60 coal mining camps or towns, approximately one every 1/2 mile along the gorge. But by the 1950s, most of these coal towns were abandoned due to the closing of the mines they were built to support. The coal mine at Kaymoor was one of the largest and most productive, and therefore hung on longer. Even it closed in 1962. At Quinnimont, today we can see the CSX railroad yards, the two formerly segregated church buildings, remnants of the iron furnace, and a granite monument to honor Colonel Joseph Beury as the first mine operator to ship coal from the New River fields. Prince still has an Amtrak station, the former C&O Railroad brick station opened in 1946. It is an acclaimed example of the Art Moderne style of architecture. Old US-19 (WV-41) is one of the few major automobile routes crossing the New River within the New River Gorge. As a result, the community is one of the more populous of the inhabited communities in the gorge. A relatively large number of vacation homes have been built along the New River near Prince. Prince dates to 1870, built at a junction of a railroad branch line. It grew in the 1890s, when the Royal mining company built a tipple and a battery of 78 coke ovens. No mine was here, but coal was transported from a mine on the other side of the New River to the tipple in buckets suspended on a wire cable that spanned the New River. The town occupied one of the best locations for a town, and its general store, the Prince Store, outlasted all other company stores in the New River Gorge, closing in 1984. At Abingdon, Virginia, we hit US-11. Generally, we should not cross other north-south, odd-numbered routes, but these mountains have limited good locations for roads. As a consequence, we cross a couple others in a short distance, running along with US-11E to Johnson City, Tennessee. Near Bluff City, Tennessee, US-19 splits into two, with US-19E heading south through Elizabethton, Tennessee and then North Carolina. We traveled most of US-19W on our US-23 roadtrip because it meets US-23 just north of Johnson City. You can read about that section, running to southwest of Erwin, Tennessee, on that page. Highway US-19W then finally crosses into North Carolina and the two parts of US-19 reunite near Bald Creek. Shortly after, we meet US-23 again. This time it stays with us for the next 41 miles, all the way to Lake Junaluska, North Carolina. Highway US-19E covers about 76 miles between the division points, while US-19W covers only 63 miles. Confusing? That’s why I have the map above. At Lake Junaluska, North Carolina, US-19 leaves US-23 while US-19A travels with it to Dillsboro, North Carolina. You can read about that portion on Day 14 of our US-23 roadtrip. I’m traveling US-19 to one of my favorite places, Cherokee, North Carolina and the Great Smoky Mountains National Park. Cherokee sits just a few miles from the main park entrance on the south side of the mountains, and provides easy access to many of the most scenic spots. Excellent hiking, mountain vistas, waterfalls, a working grist mill, and a pioneer farm museum are just a few of the sites in the park that you can visit from Cherokee. The Cherokee Tribe also hosts several tourist attractions, including the Museum of the Cherokee Indian and an outdoor drama, Unto These Hills, which debuted in 1950. There are also some souvenir shops and restaurants that have been here since 1962. And, you can even stay in a 1960s era motel if you wish; there are several still in good condition. I’ve read good reviews of the Pink Motel and several years ago I stayed at the Pioneer Motel. If you do stay in town, remember to drive out to either the high school or the pioneer farm museum at twilight to see the local elk herd! Highway US-19A meets back with US-19 just a few miles west of Cherokee, at Ela, North Carolina. Another favorite spot of mine in these mountains is the Nanthahala Gorge on the Nantahala River, which US-19 travels right through! There are several river rafting outfitters and a wooden observation deck at a waterfall where we enter the gorge on the north end. The Appalachian Trail also crosses the highway at this point. The river has a variety of rapids and cascades for the next nine miles and rafting the white water has become very popular. Our direction on US-19 faces upriver, so we get to watch the rapids and rafters, kayakers, and canoeists heading towards us. Besides the water, I enjoy the feeling of being surrounded by the mountains as we drive. The area is part of the Nantahala National Forest. The National Forest Service operates the Ferebee Memorial Picnic Area on the river near the center of the gorge: I recommend having your picnic there and enjoying the views. If you want a hike, there is a suspension footbridge across the river leading to a trail on the opposite bank. There are several very scenic waterfalls along the unpaved Wayah Road, which runs east from the point where US-19 exits the gorge. I’ve seen fishermen along that part of the river, which has been named one of the 100 Best Trout Streams in America by Trout Unlimited. It is even used for competitions, clinics, and practices held by the US Men's and US Youth National Fly Fishing teams. The south is the home of overlapping US-numbered routes, and so we hit US-23 once again at Atlanta, Georgia. Route US-19 enters on the north side of the city, passing by the Brookwood Hills Historic District. This is an area of approximately 90 acres and more than 250 residences developed between 1922-1930. The pleasing curvilinear street system was designed by civil engineer O.F. Kauffman clearly shows the influence of Frederick Law Olmstead, with whom Kauffman who had previously worked. The homes are generally large and of brick, in a semi-rural setting, and reflect the full range of early 20th-century architecture including Tudor, Colonial, Neoclassical, Bungalow, and Cottage styles. This beautiful historic district is complimented by a large recreation area and two landscaped entrances to the subdivision. It’s well worth a drive around before you get back onto US-19. We then go through the heart of downtown and leave with US-41 for Florida. If we had been traveling in Florida during 1962, we would have seen red US-19 signs. These signs were allowed by the 1956 manual that governs highway signs in the United States, the “Manual of Uniform Traffic Control Devices”. Only a few state used colored signs, so you may never have seen them. Besides Florida, Connecticut, the District of Columbia, Arizona, and Mississippi had a full range of colors, usually a different one for each numbered route. Kansas and Louisiana used green signs for all of their US-numbered routes. By the 1980s, the signing manual had changed, settling on a standard black-and-white sign, and states started phasing out the colored shields. Florida officially ceased producing colored US-route markers in 1993, but old stocks were used until they ran out. The last of the old colored signs were posted in 1996, so you might find a few faded signs somewhere around the state. A highlight of US-19 in Florida for me is Weeki Wachee Springs. It’s one of Florida’s oldest roadside attractions, entertaining audiences since 1947. The area around the springs was nearly uninhabited in 1946, when former Navy frogman Newton Perry scouted out Weeki Wachee as a good site for a new business. He was interested in the natural springs, one of the deepest natural underwater caverns in the United States. The springs discharges over 117 million gallons of clear, fresh 74-degree water a day. The name is a version of a local Seminole Indian word for little spring or winding river, which may have referred to the Weeki Wachee River that flows from the spring 12 miles to the Gulf of Mexico. Though the spring is deep, the area near the surface had been used to dump old cars and other junk. Newton had that cleared out and created a basin in the limestone for performances. He developed the method of breathing from hoses supplied by compressed air, which gave the “mermaids” the appearance of free swimming that would never have been achieved wearing air tanks. He then built the first underwater theater, which had only 18 seats, and found local pretty girls to train in his breathing method. In case you can’t make it to Weeki Wachee, here’s the 1961 video “Beauty in the Deep” showing the performance. After all the preliminary work, Newton had a business. The girls performed much of the same show we could see in 1962 or today. They drank and ate under water, performed ballet moves, and just generally looked good swimming in mermaid and other costumes. In the early days, as an advertising gimmick, the girls would also attract traffic out on US-19 wearing their bathing suits. By the 1950s, Weeki Wachee became one of the country’s most popular tourist attractions. It was bought in 1959 by the American Broadcasting Co., which operated the ABC television network and had also been the main bankroll for Disneyland! They constructed the current 400 seat theater, moving it deeper underwater to allow greater scope for the underwater shows. ABC also developed themes for the underwater shows with elaborate props, lifts, and music. Performances expanded to storylines such as an underwater circus, mermaids and pirates, Alice in Wonderland, The Wizard of Oz, Snow White, and Peter Pan. By the time I first saw Weeki Wachee in the early 1970s, they had eight shows a day, sold-out crowds, and employed 35 mermaids who came from all over the world! As with many old tourist attractions, eventually tastes changed and so did the attraction. In 1982, Weeki Wachee added a waterpark, Buccaneer Bay. You can now swim in the waters from the springs yourself. You can also go canoeing and kayaking and take a glass-bottom boat tour. The State of Florida purchased the property in 2001 to ensure the preservation of the springs’ freshwater supply and leased it the Florida State Parks to operate in 2008. That brings us just about to the end of US-19, which is just across the Sunshine Skyway Bridge south of St. Petersburg, Florida. I guess I’ll watch a Gulf of Mexico sunset now and see you on another Roadtrip-'62 ™ journey down another highway next time. Smokey Bear is the longest running public service ad campaign in Ad Council history, running since 1944. At the beginning, Walt Disney loaned Bambi for use on a poster for one year, but that image proved so popular that it is still being used. The original message was slightly different, as "Only You Can Prevent Forest Fires." I hope you enjoy this ad, similar to what you might have seen in 1962, and heed Smokey's message.